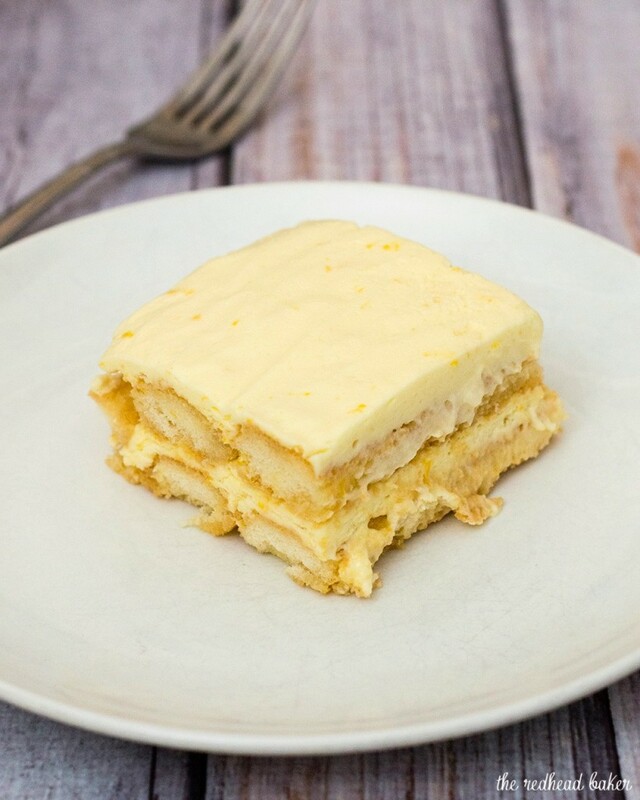 Lemoncello tiramisu adds a burst of bright flavor to the traditional layered Italian dessert. Last week’s Sunday Supper theme was Greek food. This week’s theme is Italian food! Welcome to Italian Fest! I chose to make a variation on one of my favorite Italian desserts, tiramisu. Tiramisu translates to “pick me up,” in a nod to the espresso in the dessert. The dessert layers rows of ladyfinger cookies with mascarpone-based custard. This variation starts the same way. However, instead of coffee, the primary flavor is lemon. Lemon is infused into this dessert in multiple ways. The ladyfinger cookies are soaked in lemon syrup. The custard gets lemon flavor from lemon liqueur, lemon juice and lemon zest. Store-bought ladyfinger cookies (also labeled savoiardi cookies) are preferable to homemade ones. Store-bought ones are crisper; homemade are too soft, and would fall apart when dunked in the syrup. Some stores sell the with the other cookies, others sell them in the international aisle (though some stores don’t carry them at all). I used Meyer lemons for the slightly more sweet, less tart flavor; however, you can use regular lemons instead. Meyer lemons can be hard to find out of season. A word of warning: you will probably use every mixing bowl you own to make this recipe. You need a medium one for the egg yolk mixture, a large one for the mascarpone, and a third for the egg whites. It will help if you have both a stand mixer for the egg whites and a hand-held mixer for the mascarpone, but it’s not necessary. The bowl for your egg whites must be 100% clean and 100% dry before you place the whites in it. If there is even a speck of fat in your bowl, the whites will not whip. 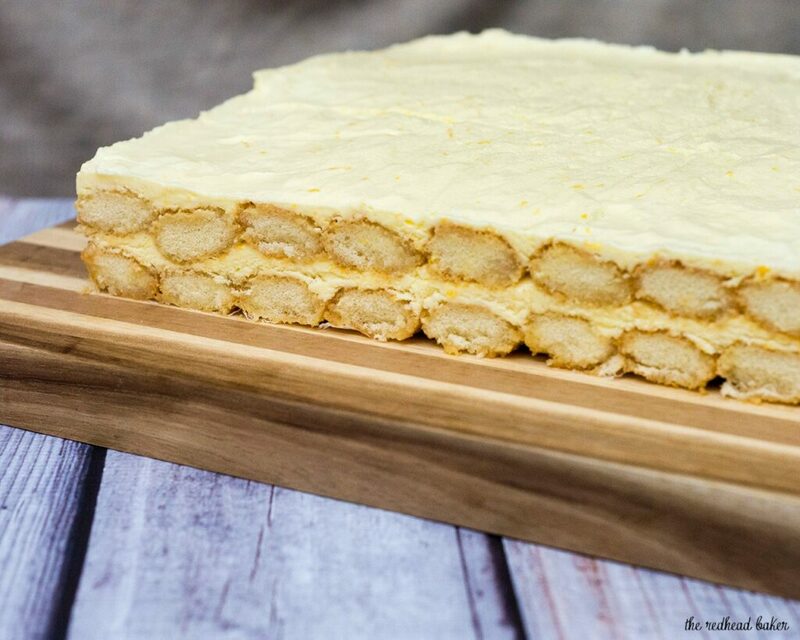 All of that being said, this lemoncello tiramisu is so worth all of the trouble! The lemon flavor is incredible, and the presentation is beautiful. If you want clean slices, freeze the lemoncello tiramisu. Once thoroughly chilled, run a knife under HOT water for a few seconds, wipe dry, then cut into the tiramisu. Repeat with hot water, wiping dry and cutting. The yolks in this recipe are heated enough to sterilize, but the whites are not cooked. For that reason, young children, the elderly, pregnant women and the immuno-compromised should not consume this recipe. If you want to serve it to anyone in those groups, you can use meringue powder in place of the egg whites. See directions on the product for how much meringue powder to substitute for 5 egg whites. Line a 9x13 baking sheet with wax paper, letting it hang over the edges on two sides. Fill a large saucepan with about an inch of water and set it over high heat until the water comes to a steady simmer. Reduce the heat to keep water at a steady simmer. Place two cups of ice in a very large mixing bowl and fill with about 2 inches of water. Place the egg yolks, 1/4 cup of sugar and 1/2 cup of the lemoncello in a medium mixing bowl. Place the mixing bowl over the simmering water, and whisk vigorously until the mixture thickens (about 5 minutes). Take the mixing bowl off the double boiler and place the mixing bowl in the ice water. Empty the simmering water from the saucepan. Place the 1 cup of water, the remaining 1 cup of lemoncello, the lemon juice, and 1/2 cup sugar in the saucepan. Heat over high heat until boiling, and cook at a boil for 5 minutes. Set aside to cool. In a large mixing bowl, with a hand-held mixer or whisk, beat the mascarpone cheese until softened. Add the lemon zest and beat until light and fluffy. In the bowl of a stand mixer with a whisk attachment, beat the egg whites until frothy. Gradually add the sugar and beat until the whites form medium peaks. Fold a third of the egg yolk mixture into the mascarpone cheese, then fold in the rest of the yolk mixture. Then fold in the egg whites, a quarter of the whites at a time. Quickly dunk 20 ladyfinger cookies one at at time in the syrup and place in the baking pan. Place each cookie very tightly next to the other to form a layer. Trim cookies as needed to completely fill the bottom of the pan without gaps. Spread half of the lemon custard over the cookies, and smooth with a spatula. 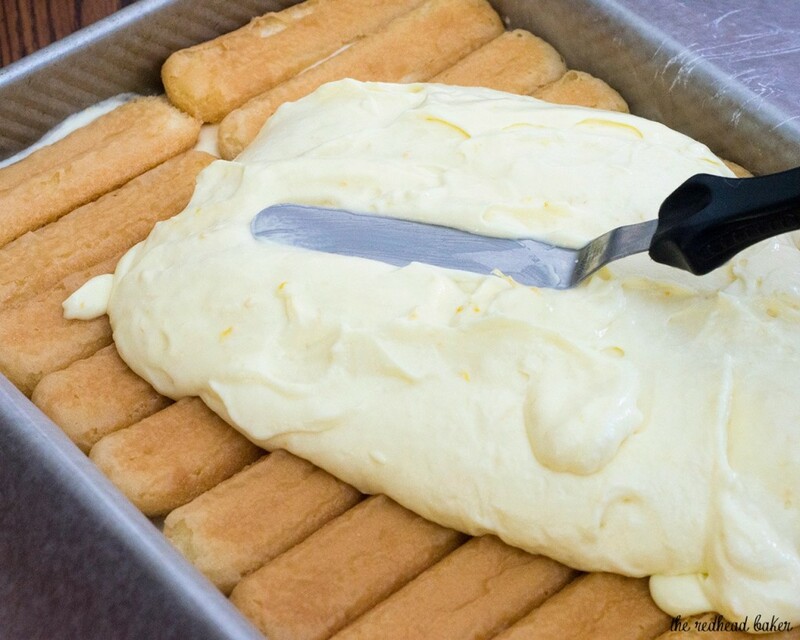 Repeat dunking the remaining ladyfinger cookies, and spread the remaining lemon custard over top. Fold the wax paper overhang over top of the lemon custard. Place plastic wrap over the whole baking pan, and refrigerate for at least 6 hours. Cut into 3x3 squares and serve. Refrigerate any leftovers. Discover more #SundaySupper Italian Fest recipes! A must try recipe! 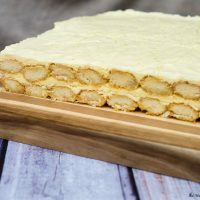 I am a big fan of Limoncello and lemon desserts, so this is a tiramisu version that I know I would love! I love all the versions of tiramisu this week—lemon will be my next to try! Beautiful! This looks amazing! You combined two of my favorite things. I can’t wait to try this. That bright fresh lemon flavor must taste like sunshine. Love the tip about freezing the tiramisu before cutting, Coleen! Such a great twist on tiramisu! Yours is so pretty too. I always think tiramisu can be rather messy but you prove otherwise. My whole FAMILY would devour this, we make our own limoncello and this would be a great pairing! Looks delicious! Love the addition of Meyer Lemons and Limoncello. I love how much freshness the lemon adds to this dessert! Oh my gosh! I might just lick the screen! Sooooo, delicious. Thank you for sharing this recipe. Brava! What a fun version of this classic dessert for Spring! I bet the lemon would add a brightness to tiramisu not present in the traditional version. It looks delicious! And I have limoncello, too! You can bet I’ll be making this. 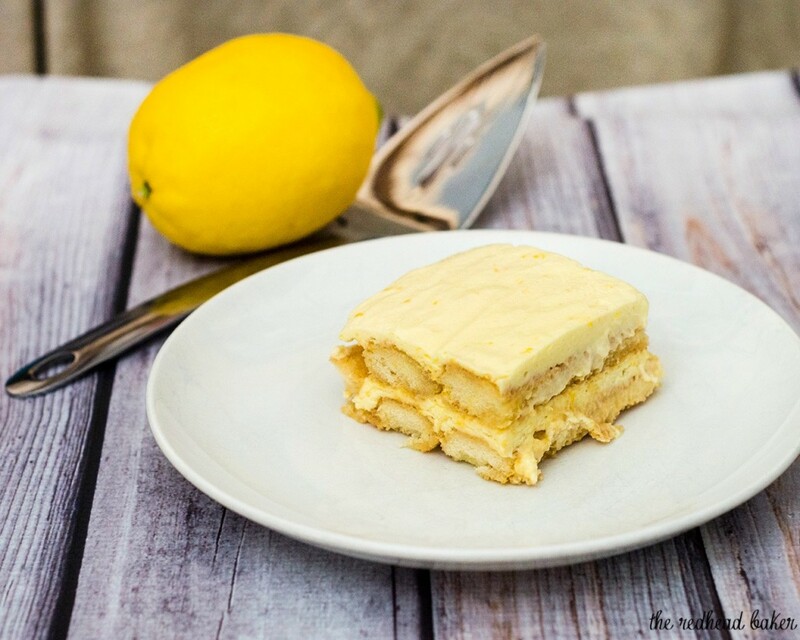 Tiramisu is my favourite dessert and I also love lemons – so this can only be good! I must just share: I was in Canada a few weeks ago and could not find lady finger biscuits anywhere – how odd is that?! I will do it tonight. It. looks delicious and fresh. Tiramisu is the best dessert ever my housebound knows. So why not a summary version! Where do you buy lemon cello? I want to try this recipe? When I search it corrects to limoncello. It is limoncello, it said otherwise in the recipe. I figured it out. Thanks anyways.